Photo courtesy the Tree Doctor. 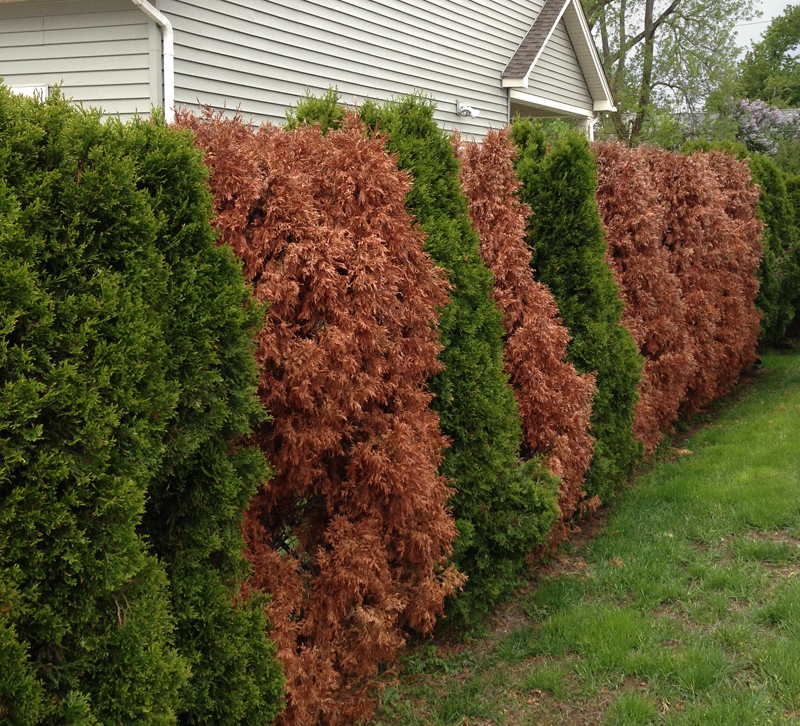 The arborvitaes above have been damaged by drought, but don’t wait until your trees look like that to take action. Our spring has been dry enough that you should already be watering your trees, especially young trees and old trees, said Jeremy P. Sayers, president of the Tree Doctor and a board-certified master arborist. We all remember last summer’s drought, but you may not realize that we’ve been experiencing dry conditions for 20 years now, said Sayers. Check out these maps at the U.S. Drought Monitor that show dry or drought conditions going back to 1999– You may be surprised at how how many dry periods we have experienced in Western New York. This year is starting out dry, too. “We’re averaging less rainfall than is considered normal and healthy for trees,” Sayers said. Over the winter, our precipitation was only 65 percent of what we normally receive, and the dry winter impacts the amount of water available to trees in the spring. Spring is a crucial time for trees because they need lots and lots of nutrients because they’re expending lots and lots of energy putting out leaves, Sayers explained. 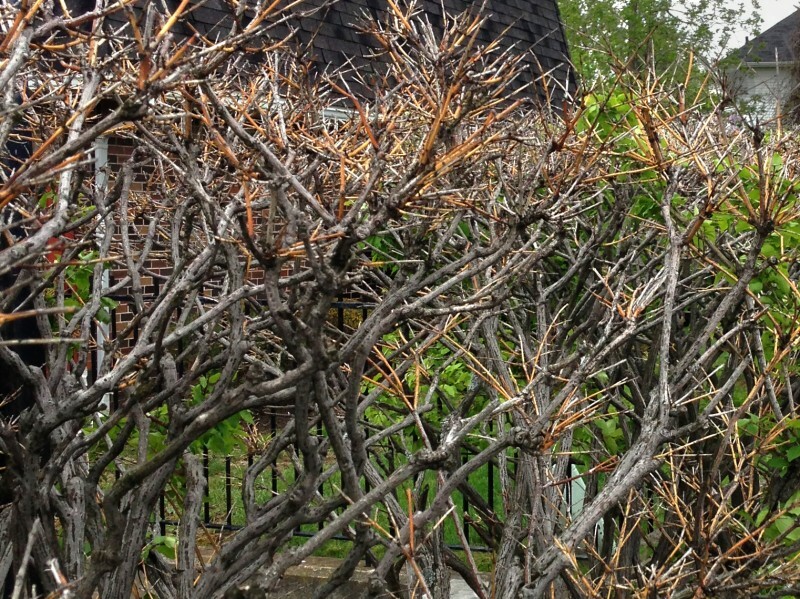 A burning bush shows damage from lack of water. Photo courtesy the Tree Doctor. Making matters worse, we have had a dry spring, too. At the beginning of May you could see cracked earth in Western New York. This spring we’ve had a rain event once a week or once every other week and that’s not enough, he said. Two or three nights a week we should get 1/4 inch or more of rain. At least the cooler temperatures we had in April and earlier in May helped keep moisture in the ground. In general, we want a moderate amount of rain every few days over a long period of time, Sayers said. Instead, our rainfall has become more sporadic. And when we do get rain, it can be heavy, and heavy rain just makes things worse. Heavy rain can run off rather than soaking into the soil. Heavy rains can also flood areas, so you have several inches of standing water in your yard. When the soil gets super saturated like this, air is forced out of the soil. The result is that trees can’t absorb nutrients or release gasses. “Too much rain is as bad as not enough rain,” he said, adding that drought followed by heavy rain is just a bad situation on top of a bad situation. These weather patterns with drier conditions and more fluctuations in weather are part of the new normal for Western New York, he said. While there are ways that a tree can show you it’s thirsty, a tree can also be suffering from drought stress without showing any symptoms at all. When trees don’t get enough water, the fine hairs in the root system die. With damaged roots, the tree can’t draw up nutrients. The tree can live off stored energy and look fine for now, he explained, but the tree may fail one or two years down the road. When a tree does exhibit symptoms of drought stress, those symptoms can include curling leaves, leaves with burnt edges, wilting leaves and premature dropping of leaves, especially interior leaves. These symptoms could be signs of other problems, such as insect damage. However, that could be tied back to drought stress, too, because drought stress can leave trees more vulnerable to insect damage. What should you do about drought-stressed trees? To keep your trees healthy, water them. “People should already be irrigating this year,” Sayers said. The rule of thumb is that if you have gone three days without a good, soaking rain, you should irrigate, he said. He noted that sprinkler systems are fine for grass but they’re not great for trees because they don’t allow enough water to soak deep into the soil. Trees need moisture four inches below the sod. That’s not four inches from the top of the grass; that’s four inches from the bottom of the grass roots. For deeper watering, take the nozzle off your hose and run the water at moderate speed. Soak the root zone of the tree. You can also use a soaker hose. How do you know if you’re watering effectively? Dig a hole four inches below the sod. If the soil is damp, you’re in good shape, Sayers said. If it’s powdery dry, you’re not getting enough moisture into the soil to help the trees. Remember that much of the water will be absorbed by the roots at or beyond the drip line, not at the base of the trunk. The root system of a mature tree can spread out one to three times the width of the canopy, so that’s the most efficient area to give your trees a drink. When it comes to newly planted or young trees that have yet to attain much of a canopy, water needs to be applied closer to the trunk area. New trees need more water than established trees. As the tree matures and the canopy spreads, widen the watering area. Once a tree is established, reduce the frequency of watering. 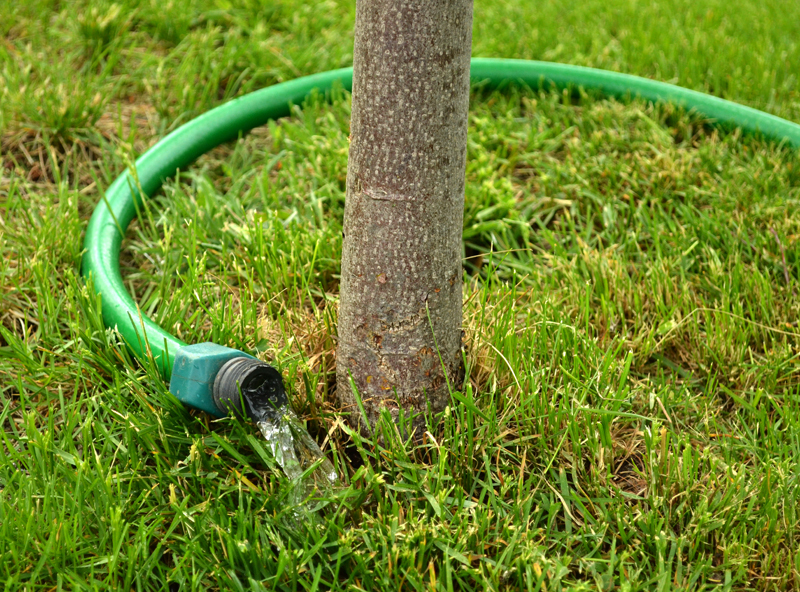 Get more tips on watering trees at the Tree Doctor website. Fertilizing can help a drought-stressed tree, but you must use the right kind of fertilizer. You don’t want a high-nitrogen fertilizer that will encourage leaf growth, but a fertilizer that is high in potassium and phosphorous and will stimulate root growth, Sayers said. The Tree Doctor has a new kind of fertilizer developed especially for drought-stressed trees. It helps the trees bounce back if they have already been damaged and makes them more drought tolerant, he said. 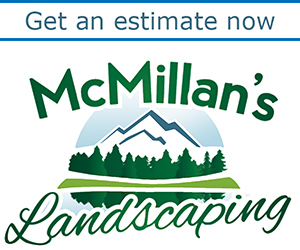 It must be applied by the company’s professionals, but it’s not as expensive as lawn fertilizing treatments, Sayers said. It costs $5 to $50, depending on the size of the tree. Since trees are expensive plants, it may be a good investment. The fertilizer can be applied now through mid-June or in the fall. You can contact Sayers at the Tree Doctor if your tree is showing symptoms of drought stress or disease, but he emphasizes that you should begin watering your trees before they begin to have problems. Good post and information. The drought monitor is a great site. Useful to show the reality of a situation. As I was doing the interview and writing the article, I kept thinking, “It’s not that dry here, is it?” The maps really helped me get an overall view. I love your articles and gardening hints…the drought maps are interesting! I am planning what I will plant for annuals this year based upon the moisture issue. 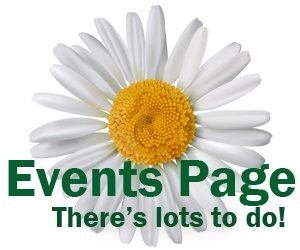 I pick up some great information and look forward to receiving it! Does anyone have a long range summer forcast for us (sunny, hot, overcast?). Sally, long-range weather forecasts are very difficult to make. You can’t make a weather forecast that is accurate nine days or more into the future. At that point, you can’t get a weather forecast that is any more accurate than climate predictions. (See The Signal and the Noise by Nate Silver, which talks about making accurate predictions and has interesting information on weather predictions.) To talk about what the upcoming summer will be like, you can look at climate patterns. Our new normal for summer in Western New York seems to be hot and drier than it was 20 years ago. Keep these new weather patterns in mind as you choose plants. Do you remember when we used to depend upon “The Farmers Almanac” for the weather predicition for the growing season? Thanks for the info. – I will do some reading in Nate Silver’s book! Happy gardening! You can still use the Farmers Almanac; it’s even online. I just don’t think it’s particularly helpful because it’s so vague. Plus, it might not even be correct. I don’t know of anyone who keeps track of how accurate its seasonal predictions of weather are. If you use it and find it helpful, let me know!